The weather is getting warmer which can make following safer sleep advice more complicated. It is harder to keep baby cool and holidays and travel can disrupt routines. We have put together some tips on how to enjoy the summer and keep baby safe when the weather gets hot. Car seats are essential for safety when travelling but babies should not sleep in a car seat for long periods as many aren’t flat, which can mean babies are slumped over. We recommend on longer journeys that you take regular breaks where baby is removed from the car seat and if possible have an adult sit with the baby in the back of the car, or use a mirror so you are able so you are able to keep an eye on them. If a baby changes its position and slumps forward, then parents should immediately stop and take the baby out of the car seat. 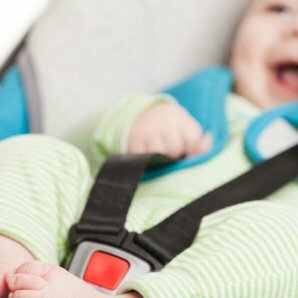 Babies should not sleep in car seats when they are not travelling. To reduce the risk of sudden infant death syndrome (SIDS) babies should be slept on their back on a firm, flat, mattress for every sleep day and night. It is important that this routine is followed on holiday. If your baby is sleeping in a travel cot the mattresses are often thinner and feel harder but don’t be tempted to place folded blankets or a quilt under the baby to make them ‘more comfortable’. Ensure that the travel cot isn’t against a radiator, in direct sunlight, and is out of reach of blind cords and hazards. Babies’ prams and buggies should not be covered with blankets, cloths or any cover that prevents the air circulating. Covering a pram or buggy with a blanket could lead to overheating, which increases the chance of SIDS. Using a cover also creates a barrier between parent and baby, which is slightly risky as parents won’t be able to see if their baby is having difficulties or monitor their temperature easily. 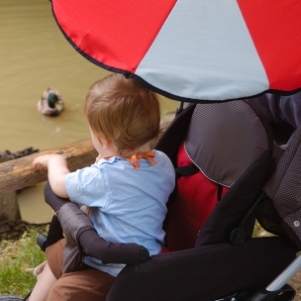 We recommend attaching a clip-on sunshade or parasol to a pram or buggy and checking if baby is getting too hot by feeling their tummy or the back of their neck. Keep babies out of direct sunlight as much as possible. When the weather is hot it is important to make sure that your baby has plenty of fluids. If bottle fed, babies under six months should be given cooled boiled water or for babies over six months just water from the tap. Fully breastfed babies don’t need any extra water until they start eating solid food. Babies that get too hot have a greater chance of SIDS. 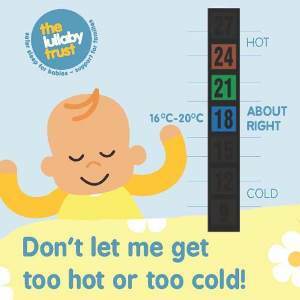 We recommend keeping the room where your baby sleeps at a fairly cool temperature of 16-20°. This can be more difficult in summer months or when away somewhere warm. If the room where the baby sleeps is difficult to cool use lighter bedding and clothing and open the bedroom door and a window, if it is safe to do so. Baby sleep bags will have guidance on what tog to use for each season. You might also like to use a fan to cool the room, but don’t aim it directly on the baby. A thermometer can help you to make sure the room is at the right temperature. 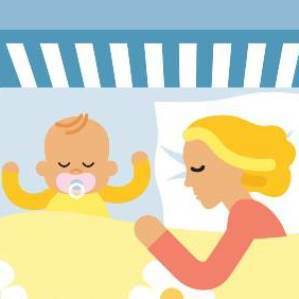 If you or your partner are having an alcoholic drink, smoking or taking medication that could make you drowsy on holiday (or at home) co-sleeping with your baby can be very dangerous and increases the risk of SIDS. In these circumstances your baby should be slept in a cot or Moses basket in the same room as you.